Things are getting back to normal at the Obama camp. He had a nice boost in popularity from those who say they like him or really like him. The event that triggered it was the State of the Union address. But now they are back down in the cellar again. Maybe it was the flurry of media attention and their heaps of praise for his speech. Or maybe they actually watched it. Anyway, the bleeding hearts in his own party were in love again, boosting his approval rating. 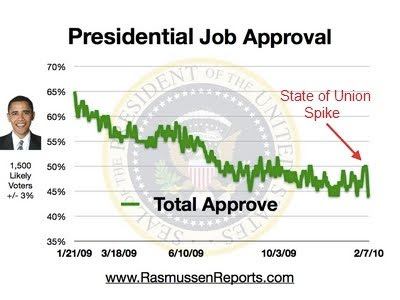 He even had a few days of shrinking "strongly disapprove" numbers. But what about the "minds" of the voting public? What about the Independents? Well, according to Rasmussen, he didn't change their minds. "January 30, 2010: Looking only at interviews conducted on the two nights following the speech, it is clear that the President enjoyed a bounce in the polls and that the bounce came from members of his own party. On the morning of the speech, 50% of Democrats Strongly Approved of the President’s performance. On the two nights following the speech, that number jumped to 65%. There was essentially no change among Republican and unaffiliated voters." So, the cooler heads still prevail. And the magic has worn off, except for those Rasmussen calls "Very Liberal" and "Somewhat Liberal." They are still in love with #44.